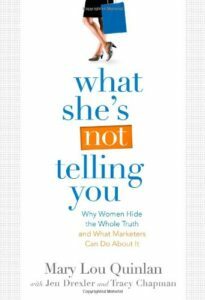 At this year’s Marketing2Women conference, the authors of “What She’s Not Telling You” unveiled a critical behavior among female consumers: the tendency to disclose Half Truths (what they are willing to admit) and to hide Whole Truths (what they really believe, do and buy). As the most powerful consumers on the planet, women are the voices on the customer service line, the fingertips on a website, and a brand’s most powerful alliance. Unfortunately, many times they’re only telling a portion of what they’re really feeling. Example: for years women 40 years and older have voiced frustration at not being able to find age-appropriate clothes. Enter the leaders of The Gap, who created “Forth & Towne,” a chain of stores for boomer women with “age appropriate” sizing and styling. Unfortunately, Gap neglected to ask the boomer women the question that would have led to the Whole Truth: What age do you consider yourself? Had they done so, they would have found that lots of those 50-year old women saw themselves as around 35 years of age, which translates to clothes and stores that balance comfort and cool. As the book says, R.I.P. dowdy Forth & Towne. Half Truths are a habit — they cut the conflict and smooth the way. They are not meant to intentionally deceive, but are shortcuts that allow women to get on with their busy lives. Marketers need to recognize those Half Truths and dig to find the bigger Whole Truth, or the result will be unremarkable products, mediocre communications and mundane retail experiences. « The Purchasing Power of Women: The Marketing2Women Conference	» Where Did Everybody Go? Fascinating post. Had never heard the term ‘half truths’. Interesting in the way it applies to marketing and interesting in the way it applies to my forty-something self.